Thirty-four years ago, I went to see my first Bruce Springsteen show – December 30, 1978 at Cobo Arena in Detroit, way up in the nosebleed seats. At this point I had a couple of his albums, Born to Run and Darkness on the Edge of Town, but I was a casual fan. Well, I lucked into seeing Bruce on one of the most legendary rock tours of all time. I was an instant convert! That date remains the best rock concert I’ve even been to, the one that moved and inspired me the most deeply. 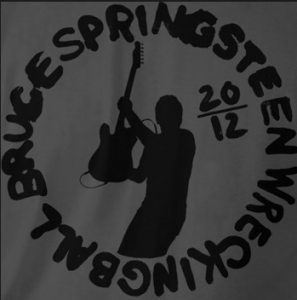 But wow, Bruce’s concert last night in Oakland sure comes close. I’ve seen Springsteen several times in the years in between, including on tours for Human Touch / Lucky Town, The Rising, and Working on a Dream. All have been top-notch, but this went a step above. I was wondering how this would all come off at first. The loss of Danny Federici before the Working on a Dream tour was sad enough. But the loss of the Big Man, Clarence Clemons, would have far more impact on the stage show. The Big Man and Miami Steve Van Zandt had been Bruce’s main foils on stage. How much would this feel of a “band of brothers” (and more recently sisters) translate with more and more new people in the band? Naturally the Big Man was irreplaceable, so Bruce went with something way different. He came on stage with a 16-piece ensemble! There were 8 in the E Street Band, 5 in the E Street Horns, and 3 in the E Street Choir. With the voices, a full horn section, a violin, 3 guitars, 2 keyboards, bass, drums, and percussion, the 17 people on stage could provide just about any timbres and feel you could want in a rock concert. Darcy James Argue calls his big band steampunk because the need for big bands really went away with the advent of amplification. Though the need was gone away, the desire remains – some people still crave the sound of a jazz big band. Well, the same rings true here for this rock and roll big band. More than any concert I can recall, moments in the concert transported me back to the young man who attended that 1978 concert, both his dreams and his fears. This really hit home with a scary intensity during Badlands – the last number before the encore in this concert, the opener back in 1978. Bruce played lots of 1978-era music in this concert, including several songs I first heard live in Detroit – Because the Night, The Ties That Bind, and Santa Claus Is Coming to Town – along with a great double-shot of Adam Raised a Cain and Something in the Night near the top of the show. The accumulated weight of those memories and resonances really took over in Badlands, a quintessential song about youthful dreams and fears. Strictly at a musical level, the deployment of the big band came to a stunning peak on Kitty’s Back. The pacing of the solos was just exquisite, like the best big bands. A series of shorter, soulful horn solos led to a larger, more intense piano solo by Roy Bittan, which in turn led to an even more intense guitar solo by Springsteen. Bruce has three fine guitar players in his band between himself, Van Zandt, and Nils Lofgren, but I still love his own solo playing most of all, ever since hearing his lengthy solos preceding Backstreets and Prove It All Night back in 1978. The jazzy ecstasy of this number added a new musical wrinkle to Bruce’s show, something he couldn’t do as effectively in quite this way without the full horn section. The tributes to Clarence Clemons and Danny Federici were greatly moving. Bruce dedicated My City of Ruins as a song “from our ghosts to yours.” The long solemn moment at the end of the song where the spotlights focus on the empty spaces where Danny used to sit and the Big Man used to stand was highly effective. On the final number, Tenth Avenue Freeze-Out, the remembrance was celebratory rather than solemn, rejoicing in the great music the band had made together with those two over so many years. Bruce latest album Wrecking Ball is perhaps his most highly charged since The Rising. He cherry-picked the best songs from the album and performed them with great fire. The concert opened with Land of Hope and Dreams, which you might have heard during the US election at President Obama’s events. The triple shot of We Take Care of Our Own, Wrecking Ball, and Death to My Hometown was searing. It ensured that the evening was hardly an exercise in nostalgia – it included significant new music and new performances rooted very much in the here and now. So it was an amazing night – I’m still on overdrive from it twelve hours later. This leg of the tour is almost over, but I know they’re continuing in the summer over in Europe. And if you think I’m exaggerating about the 1978 tour, the box set The Promise includes a video from a show just three weeks before the one I saw. I had to get that box set to make sure I wasn’t dreaming that the concert was that great. I wasn’t; it was. I sure hope someone has been recording this tour, because a live album/video from it would be a great thing indeed.